Congratulations, you've been invited to have the most amazing weekend of your life. Quit your job, alienate your family, and come learn how to windsurf better. You're coming to Corpus Christi on August 17. We'll leave Austin on Friday at 7am and return on Sunday afternoon after sailing. If you're new, take a look at some of our previous trip posts. If you have an invite please respond. If you don't have an invite, you can shoot a mail to john AT windaddict dot com. Make reservations at the Best Western Marina Grand hotel, the Bayfront Plaza, or arrange to share a room with someone who did. Check in on 17 August, checkout 19 August. I am staying at the Best Western. When I checked, the 14 day advanced discount was the best deal there. You are responsible for your own hotel reservation. Call Worldwinds at 1-800-793-7471 and schedule your classes, or reserve a board rental if you don't want to take a class. Please tell them that you're with John Knox's group. Arrange to carpool and share your room. Feel free to post comments (click below) asking for rides or riders. My currently suggested class sequence is as follows: beginner, intermediate, harness, beach start or fast tack, planing in the harness. Please check out the packing list here. You won't want to forget a critical item! Feel free to send me a mail or give a ring if you have any questions. See you on the beach! Badass! I can't wait to get out there for some harness action. I'm thinking that Karen and I will again arrive some time Friday evening, spend Saturday acquainting ourselves with the newly lightened board and broadened sail, and then class it up on Sunday. Have you picked up a set of gloves? I thoroughly recommend the Vibram Fivefingers for footwear (www.vibramfivefingers.com), but I feel like I need some hand-gear to prolong my boom-hanging stints. My $5 aquasocks have just about had it, so I may have to get a pair of those fivefingers. That is if I can manage to ignore the price. Do you have any suggestions on sizing, or are their procedures dead on? I don't have special gloves though I'm thinking about bringing my biking or weight lifting gloves. I'll probably save them until I start to get a bit beat up though. I'd prefer to have tougher hands and not need gloves. You may want to shoot for a harness class on Saturday afternoon instead of Sunday. Your hands will thank you, and you can still get a little practice beforehand. My new philosophy is to take the classes as early as possible in the trip so you have time to practice them a lot. Besides, I usually find that the instructor helps me out with lots of issues unrelated to the class. Something to consider. I have been quite pleased with the Fivefingers. I've used them for windsurfing, hiking, light bouldering, and even running. They seem to be taking the use in stride--no signs of wear on either the soles or the seams. I become much more aware of the terrain on which I am walking. They potentially make your foot more vulnerable, but my body seems to compensate naturally. For example, as soon as the ground gets a bit rocky, I unconsciously begin stepping with the balls of my feet first. This lets the foot assess the roughness and choose to reduce the pressure the heel would take. The same thing happens when running. Although I already run with the balls of my feet striking first, I noticed a dramatic decrease in the amount of heel striking (and a commensurate increase in calf soreness). I am no kinesiologist, but I suspect reduced heel impact also results in reduced knee strain. Anyway, I love them. But to each his own. I like the barefoot feel. Others may not. The sizing method is fairly straightforwad (measure your foot from heel to big toe), and the size I ordered indeed fits like a glove. I might toss my bike gloves in the trunk just in case. I'll talk to Don/Olivier and see what times they have openings for harness lessons. Alright, I'm in. Amy and I are skipping the Corpus triathlon the previous weekend, so I'm definitely up for going with you guys. I agree with John that taking the harness class is the fastest way to make your hands happier. I made the mistake of "taking a day to practice" before learning to use the harness last trip... and I ruined my hands. Do NOT surf for 5 hours without a harness. You'll be pissed. Also, once you can get the beach start down, you'll save your hands even more since you won't have to play tug-of-war with the sail very often. My el-cheapo aquasocks are about done also. Worldwinds charges $24 for their footy things, which I remember liking during my beginner lesson. I think I'll try renting a pair of those this trip, and turning my rent into a purchase if I like them. I'm glad to hear you've given in to the dark side Jason. Because good is dumb. I think I agree with Jason's implication. The beach start is probably more valuable than the fast tack (hint: you might be able to squeeze a quick fast tack lesson in during another class). Beach starts really can help you save energy so you can sail longer. Of course, the real benefit won't come until you get the water start, which will pull you and the sail out of the water no matter how deep. The beach start will only help you when you're in waist-deep or shallower water. The benefit of the fast tack is that you will probably be able to get more upwind distance with each tack. Of course, they're faster and more fun too. I think it also helps your balance and your ability to get where you want to go. But, if you just practice your normal tacks a lot and work on simplifying them you may end up with similar skills. 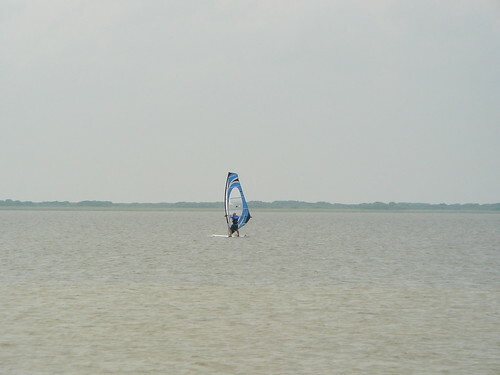 I think we'll just move to Corpus and practice windsurfing every day. No more worries about what lessons to squeeze in on the next trip. Improving my tacking is pretty high on my priority list. The walking tack of shame is great sport, but I've done it enough. Stories told to my grandchildren need no further embellishment. Have you found any decent 'instruction' sites for windsurfing techniques? I just ordered a pair of Vibram Fivefingers Sprints. Nifty. Pricy. I have not found any great instruction sites yet. www.windsurfingmag.com has some instructional stuff online, but it mostly seems to focus on the more advanced stuff. I do have a windsurfing book I can show you. Honestly, the diagrams can be a little confusing until you know what you're doing. Real on the water instruction seems about a million times better than anything else I've found so far. I practice my fast tacks in the living room like a big nerd. For techniques you do know, this can help a lot. Half the battle is getting used to the hand and foot placement. You don't need wind or water to practice that (although you can use your ceiling fan if you want). Let me know when you move to Corpus. I'll come crash on your couch.